Selection among various management options in pneumothorax requires an understanding of the natural history of pneumothorax, the risk of recurrent pneumothorax, and the benefits and limitations of treatment options. Observation without oxygen, administering supplemental oxygen, simple aspiration, chest tube placement, video-assisted thoracoscopic surgery (VATS), open thoracotomy, and pleurodesis are among these options. This article will briefly discuss the procedures for emergency needle decompression, needle aspiration, and tube thoracostomy. A 2017 Cochrane review compared the clinical efficacy and safety of simple aspiration versus intercostal tube drainage for management of primary spontaneous pneumothorax. There was low- to moderate-quality evidence that tube drainage had higher immediate success rates, whereas simple aspiration was associated with shorter hospital stays. The two groups did not differ significantly with regard to early failure rate, 1-year success rate, or hospital admission rate, but the quality of the relevant evidence was not high. Tension pneumothorax is a life-threatening condition that demands urgent management. If this diagnosis is suspected, do not delay treatment in the interest of confirming the diagnosis (ie, before radiologic evaluation) (see the images below). 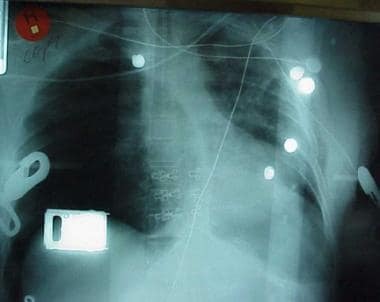 This chest radiograph has 2 abnormalities: (1) tension pneumothorax and (2) potentially life-saving intervention delayed while waiting for x-ray results. 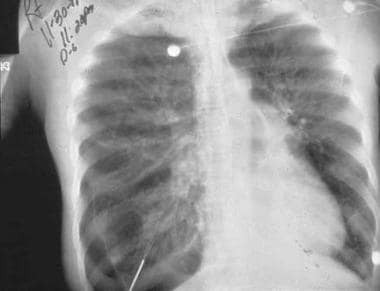 Tension pneumothorax is a clinical diagnosis requiring emergent needle decompression, and therapy should never be delayed for x-ray confirmation. 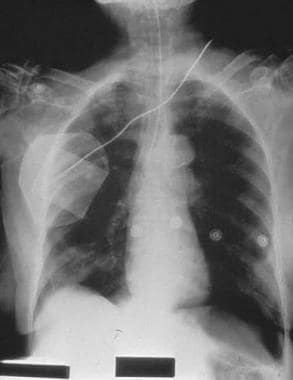 Radiograph of a patient with a large spontaneous tension pneumothorax. Immediately place the patient on 100% oxygen, ventilate the patient if necessary, and evaluate the patient for evidence of respiratory compromise, hemodynamic instability, or clinical deterioration. Essentially, a large-bore (16- or 18-gauge) angiocatheter is introduced in the midclavicular line at the second or third intercostal space. Use large-bore catheters, because hemothorax can be associated with pneumothorax, and the patient may therefore require immediate intravenous (IV) infusion. Upright positioning, if not inappropriate because of cervical spine or trauma concerns, may be beneficial. This serves as a bridge until the definitive treatment of tube thoracostomy. The catheter is left in place until the chest tube is placed. After needle decompression, immediately begin preparation to insert a thoracostomy tube. Then, reassess the patient, paying careful attention to the ABCs (ie, airway, breathing, circulation) of trauma management. An element of hemothorax along with the tension pneumothorax is common; therefore, the patient may require additional thoracostomy tubes. Obtain a follow-up chest x-ray to assess for lung reexpansion, thoracostomy tube positioning, and to correct any mediastinum deviation (see the images below). Additionally, follow-up arterial blood gases (ABGs) may be ordered. Admit all patients with tension pneumothorax. Radiograph of an older man who was admitted to the intensive care unit (ICU) postoperatively. 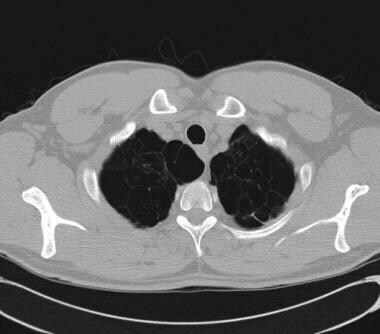 Note the right-sided pneumothorax induced by the incorrectly positioned small-bowel feeding tube in the right-sided bronchial tree. Marked depression of the right hemidiaphragm is noted, and mediastinal shift is to the left side, suggestive of tension pneumothorax. The endotracheal tube is in a good position. Radiograph depicting right main stem intubation that resulted in left-sided tension pneumothorax, right mediastinal shift, deep sulcus sign, and subpulmonic pneumothorax. Nonemergency needle aspiration can be used to treat a small primary spontaneous pneumothorax (PSP) or an iatrogenic pneumothorax (see the images below). 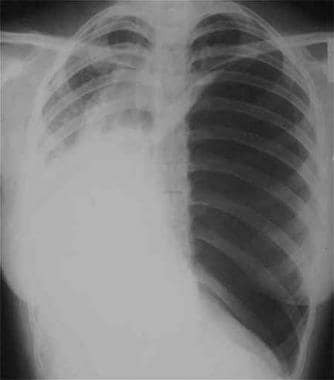 Close radiographic view of patient with a small spontaneous primary pneumothorax (same patient as from the previous image). Tube thoracostomy is the definitive treatment for secondary spontaneous pneumothorax (SSP) (see the image below) and tension pneumothorax. Needle decompression mandates an immediate follow up with a tube thoracostomy. Computed tomography scan demonstrating blebs in a patient with chronic obstructive pulmonary disease (COPD). Editorial comment accompanying the Kulvatunyou article pointed to the simplicity of pigtail catheter insertion and ease of instruction, which would allow insertion by "a gamut of healthcare professionals" to allow stabilization before transfer. For this reason, both methods are summarized below. Connect the thoracostomy tube to an underwater seal apparatus and suction. Potential complications associated with needle aspiration includes pneumothorax (with potential to later tension pneumothorax), cardiac tamponade, hemorrhage (which can be life threatening), loculated intrapleural hematoma, atelectasis, pneumonia, arterial air embolism (when needle thoracostomy is performed and no tension pneumothorax is present), and pain to the patient. Complications of tube thoracostomy include death, injury to lung or mediastinum, hemorrhage (usually from intercostal artery injury), neurovascular bundle injury, infection, bronchopleural fistula, and subcutaneous or intraperitoneal tube placement. Carson-Chahhoud KV, Wakai A, van Agteren JE, Smith BJ, McCabe G, Brinn MP, et al. Simple aspiration versus intercostal tube drainage for primary spontaneous pneumothorax in adults. Cochrane Database Syst Rev. 2017 Sep 7. 9:CD004479. [Medline]. Zengerink I, Brink PR, Laupland KB, Raber EL, Zygun D, Kortbeek JB. Needle thoracostomy in the treatment of a tension pneumothorax in trauma patients: what size needle?. J Trauma. 2008 Jan. 64 (1):111-4. [Medline]. Britten S, Palmer SH, Snow TM. 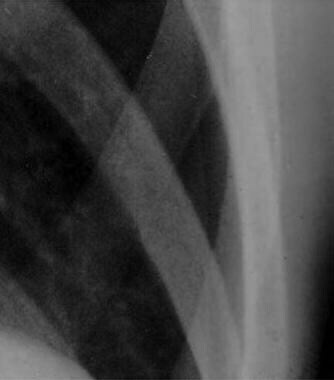 Needle thoracocentesis in tension pneumothorax: insufficient cannula length and potential failure. Injury. 1996 Jun. 27 (5):321-2. [Medline]. Clemency BM, Tanski CT, Rosenberg M, May PR, Consiglio JD, Lindstrom HA. Sufficient catheter length for pneumothorax needle decompression: a meta-analysis. Prehosp Disaster Med. 2015 Jun. 30 (3):249-53. [Medline]. Aho JM, Thiels CA, El Khatib MM, Ubl DS, Laan DV, Berns KS, et al. Needle thoracostomy: Clinical effectiveness is improved using a longer angiocatheter. J Trauma Acute Care Surg. 2016 Feb. 80 (2):272-7. [Medline]. [Full Text]. Aho JM, Thiels CA, El Khatib MM, Ubl DS, Laan DV, Berns KS, et al. Needle thoracostomy: Clinical effectiveness is improved using a longer angiocatheter. J Trauma Acute Care Surg. 2016 Feb. 80 (2):272-7. [Medline]. Inaba K, Branco BC, Eckstein M, Shatz DV, Martin MJ, Green DJ, et al. Optimal positioning for emergent needle thoracostomy: a cadaver-based study. J Trauma. 2011 Nov. 71 (5):1099-103; discussion 1103. [Medline]. Kulvatunyou N, Vijayasekaran A, Hansen A, Wynne JL, O'Keeffe T, Friese RS, et al. Two-year experience of using pigtail catheters to treat traumatic pneumothorax: a changing trend. J Trauma. 2011 Nov. 71 (5):1104-7; discussion 1107. [Medline]. Beckett A, Savage E, Pannell D, Acharya S, Kirkpatrick A, Tien HC. Needle decompression for tension pneumothorax in Tactical Combat Casualty Care: do catheters placed in the midaxillary line kink more often than those in the midclavicular line?. J Trauma. 2011 Nov. 71 (5 Suppl 1):S408-12. [Medline]. Elsayed HH, Hassaballa A, Ahmed T. Is video-assisted thoracoscopic surgery talc pleurodesis superior to talc pleurodesis via tube thoracostomy in patients with secondary spontaneous pneumothorax?. Interact Cardiovasc Thorac Surg. 2016 Sep. 23 (3):459-61. [Medline]. [Full Text]. Divisi D, Di Leonardo G, Crisci R. Vats Versus Axillary Minithoracotomy in the Management of the Second Episode of Spontaneous Pneumothorax: Cost-Benefit Analysis. World J Surg. 2016 Sep. 40 (9):2171-7. [Medline]. Almoosa KF, Ryu JH, Mendez J, Huggins JT, Young LR, Sullivan EJ, et al. Management of pneumothorax in lymphangioleiomyomatosis: effects on recurrence and lung transplantation complications. Chest. 2006 May. 129 (5):1274-81. [Medline]. Martin M, Satterly S, Inaba K, Blair K. Does needle thoracostomy provide adequate and effective decompression of tension pneumothorax?. J Trauma Acute Care Surg. 2012 Dec. 73 (6):1412-7. [Medline]. Marinaro JL, Kenny CV, Smith SR, et al. Needle thoracostomy in trauma patients: what catheter length is adequate?. Acad Emerg Med. (2003 May). 10(5):495. The authors and editors of Medscape Reference gratefully acknowledge the contributions of Trevor Kuhlengel to the research of the 2013 update.